Welcome to the Ob/Gyn Residency Program at Stony Brook. Our residency is an academic training program within a university teaching hospital, offering an environment for residents to complete their training with the highest levels of personal and professional growth. 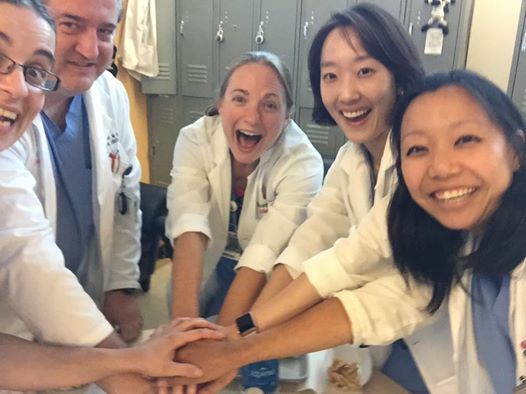 We believe that the strengths of our Residency Program are not only the academic and clinical experiences, but also the collegial working environment fostered among our faculty and residents. We attract a diverse group of enthusiastic residents to our program from all over the country. Our residents are a respected part of the ObGyn team. They treat each other like family, which creates an outstanding work environment. Our Residency Program is fully accredited by ACGME. We have a proven track record of matching residents into subspecialty Fellowship training (FPMRS, Minimally Invasive Surgery, Gynecologic Oncology, Maternal Fetal Medicine and REI). The Program's educational mission is well supported by both the Department and Institution. Our Department's faculty is actively involved in APGO (the Association of Professors in Gynecology & Obstetrics), including several APGO Educational Scholars and an APGO Electrosurgery Scholar. Two faculty have also completed the Stony Brook University Medical Education Fellowship. We have third year electives, which can include research, away rotations or International electives. We are located in a suburban community about 60 miles from New York City. We are equidistant to Manhattan and Long Island beaches or Wine Country. Night Float System, with on-call hours limited to approximately 12 hour shifts. Stony Brook is the only accredited allopathic medical school on Eastern Long Island, serving a diverse patient population of 1.5 million people. We are a Level 4 (most advanced) Regional Perinatal Center for New York State and receive referrals of the most complicated cases from across Suffolk County. We have a Level 3 NICU where we are capable of caring for the smallest and sickest newborn babies. Stony Brook University Hospital is the only level 1, Trauma Center in Suffolk County. Our Fellowship Programs include Maternal Fetal Medicine and Minimally Invasive Surgery, which enhance the residency experience. Obstetrical and Gynecologic Simulation program, including Surgical and Clinical Simulation Centers. Excellent ABOG written and oral board pass rates. Culture of Patient Safety and Quality Assurance. Applications to our program are accepted exclusively through ERAS, the Electronic Residency Application Service of the Association of American Medical Colleges. Personal interviews are by invitation only. The minimum requirements for application are listed on the Stonybrook University Medical Center's Graduate Medical Education page: http://medicine.stonybrookmedine.edu/gme/requirements. Copies of the resident contract/employment agreement and salary information can be found at the following link: http://medicine.stonybrookmedicine.edu/gme/application.